Don’t we all seek answer to this question when we stand in front of a mirror? And every time we desire it to be our own name only…isn’t it? But, time doesn’t forget to leave its mark on us, irrespective of what we wish. I recall the words of Robert Burns, “Beauty’s of a fading nature, Has a season and is gone!”. As our age increases, the appearance of crow’s feet, wrinkles and other fine lines and scars also starts, thus pushing us towards the impending consequence of skin aging that we neither want nor desire. Dermal filler is one such miracle of modern medicine that can erase the harsh stroke of time. It visibly reduces the several signs of aging by making up for the lost collagen (protein responsible for skin elasticity) and fat pads (fats that cushion our face skeletal for a youthful look). Sounds like an easy fix to the skin aging problems? Let us find out more about it! What is dermal filler in general terms? Dermal filler is a colorless, odorless, gel-based substance that is naturally found in our skin collagen, thus making it safe (with a well understood risk profile) to be used as facial fillers in the world of aesthetic and cosmetic treatments. When we age, our skin loses its elasticity and the fats that presents us a youthful look. At that point, dermal filler is injected into our skin to restore its proper volume and elasticity. As an example, let us consider there is a crack or split in your favorite wooden table. Now, to repair it, the best way is to fill up the crack with a shim, then polish the surface and repaint it to possess back that gleaming plain surface. Similarly, during aging, the loss of collagen and subcutaneous fats leaves behind some hollow space that generates folds, wrinkles and fine lines. Dermal filler fills up that space and lifts the skin making it wrinkle-free and young. When the fluid (dermal filler) is injected in the required areas of the skin, it interacts with the water content present in the internal layers of the skin and transforms itself into a thick mass that adds volume to the skin and helps in retaining youth to great extent. What are the certain areas where dermal fillers can be utilized? Thus, under the care and guidance of accomplished doctors and assisting staff, dermal fillers can do wonders to amplify the beauty of a person. Why should we choose dermal fillers? No doubt, there are other options also such as anti-wrinkle injections or surgical lift, etc. to acquire similar results, but dermal fillers have revealed some unique benefits, which make it a very wise and convenient choice for aesthetic and cosmetic cures. • It can be easily reversed if and when not happy with the results. Is there any permanent type of dermal filler? Of course, there are permanent facial fillers also but, this one-time easy fix may turn out to be quite disastrous also. If due to certain allergic reaction or immunity interference, we develop an infection from fillers, then there is no way to recover from it except for surgical strategies. So, temporary filler can be regarded as the best solution to remove folds and wrinkles. What are the possible side-effects of these fillers? At Nitai Medical and Cosmetic Centre, mostly synthetic fillers are used. They have a very low risk of allergic reaction or any other sort of infection as in case of animal-derived collagen fillers. However, the possibility of infection remains, and it varies from person to person or on the type of fillers used. This non surgical anti aging treatment may last from 9 to 18 months depending on the type and amount of filler used and the area where it has been used to give volume. Beauty not only makes us feel great about ourselves, but it also boosts our confidence to face the world in a better way. So, do not let your beauty fade away. 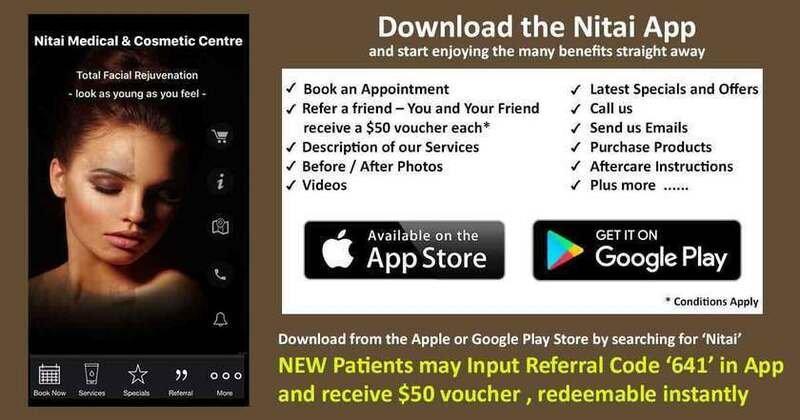 With the skill and expertise of the qualified doctors and staffs at Nitai Clinic, let us help you reverse the clock of aging. Stay young and ageless today, tomorrow…always! Previous Previous post: Accentuate Your Lips!